The Edgeware Fast Channel Change product offers visible quality enhancements to your live IPTV service, even over unreliable networks. 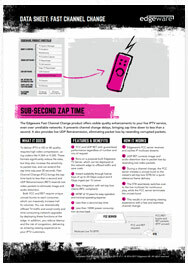 It prevents channel change delays, bringing zap time down to less than a second. It also provides live UDP Retransmission, eliminating packet loss by resending corrupted packets. To deliver IPTV in HD or 4K quality requires high video compression. This significantly reduce file sizes, but it also increases the sensitivity to packet loss, and can extend the zap time way past 20 seconds. Fast Channel Change (FCC) brings the zap time back to less than a second and UDP Retransmission (RET) resends lost video packets to eliminate image and audio distortion.